Whether you are at home or in the office, the tasks that you face every day make it difficult for you to relax and enjoy yourself for a while. Surely we all have encountered this problem, but how much have we tried to air the place and time we are doing these daily activities? 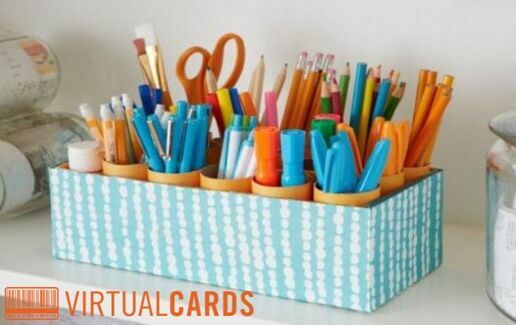 The VirtualCards team knows that you are too preoccupied to think about a strategy in this regard, so it comes to your help with some tips to help you organize yourself better at both the office and home to everyday activities. In order to organize your time as well and efficiently as you can to make sure that you reach all the goals of a day, keeping an agenda or planner in the office is the best thing you can do. Not only you get rid of the crowd of notes you score for a meeting or an urgent task you have to do, but you have everything well settled in order, without messing up hours or crowding too hard. Keep an eye on each activity, the time spent on each and the steps you have to follow, and see how you're already getting rid of office stress! In addition, you can use this method at home for sharing daily activities. And because we mentioned a better organization of time, another idea for this is a well-positioned wall clock in the office to help you always know what time it is. Nothing makes you lose the notion of time and so delay your deadlines than you do not know the exact time. An hour will always tell you how much time you have left to complete an activity or to go to a meeting. Personalize your desk and choose your favorite clock pattern! Or if you're a fashion enthusiast, you can choose a wristwatch that you can wear at your desk every day. So you are in step with fashion and always on time! After a long and hard day at the office, make sure you do not forget to stop on your way home to the shop. But how do you know if you've got everything you need? VirtualCards helps you organize yourself quickly and easily. Make your shopping list a day before in the app and so shopping will be a lot more peaceful. You will know what you've got and what not and where to find the best products. How? With the app, you'll get notifications from your favorite merchants when you're near them. You will not spend much time at shopping and go home smile! If you're facing a table full of papers, computers, phones, and so on in your office, which we advise you to set up nicely and in order to release your space, at home you are confronted with the same disorganized space because of the rush of take everything in the morning when you leave! What you can do ? In your free time, choose one room a day and make your order in things! Set your clothes in the closet according to the season, shoes in the shoe holder according to size and category. Do not let scattered objects that you use around the house, but pick them up and put them back. If you want to be quicker, you can take various storage cabinets to put in small things that you do not use at the moment, but keep them at your fingertips. This will give you more space to move and you will feel more free! You can certainly find other ways to share your time, tasks, and things so that everything works properly. It is good to be always organized and calculated to be successful every day at the office, but also at home! We've come up with some tips. What original ideas do you have to organize yourself?